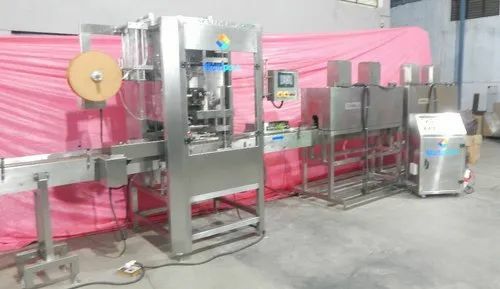 We offer shrink sleeve applicator from multipack, shrink sleeve applicator manufacturers, shrink sleeve applicator supplier hsa 220 shrink sleeve applicator, shrink label applicator, bottle label applicator tri pack, tripack sleever machine. 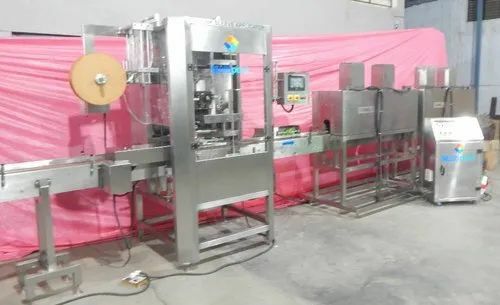 In the industry, we are the eminent Automatic Shrink Sleeve Applicator manufacturer and supplier. The offered machine is developed and engineered with high perfection and innovation by adept experts utilizing the pioneering technology and high grade components, acquired from trustworthy marketers in the market. Net Weight 1950 Kg Approx. Dimensions 5050 mm (L)x 1250mm (W)x 2100mm(H) Approx. 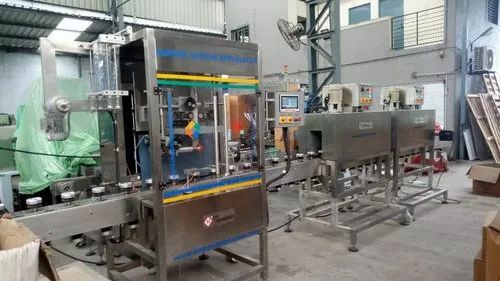 The Automatic Shrink Sleeve Label Applicator System consists of main structure, product transmission belt with guide adjustment, AC drive, PLC & HMI. Our clients can avail from us a quality assured collection of Shrink Sleeve Labeling Applicator that is precision engineered using high quality components and the latest technology under the strict supervision of our quality controllers. 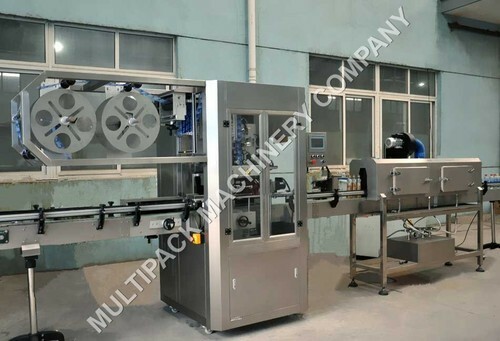 The offered labeling machine is highly valued for its optimum performance, robust construction and longer service life without much need of maintenance. 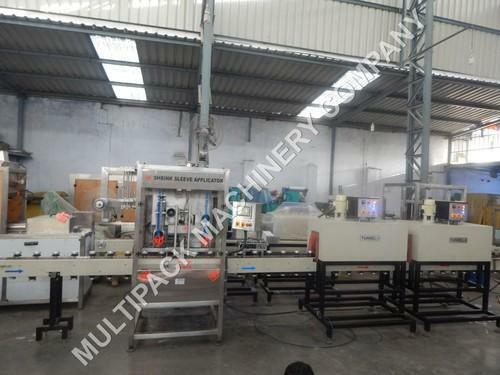 As per the specifications laid down by our clients, this machine can be offered in customized models. Accuracy Servo motors for more accuracy. Control Panel Fitted with digital PLC control. 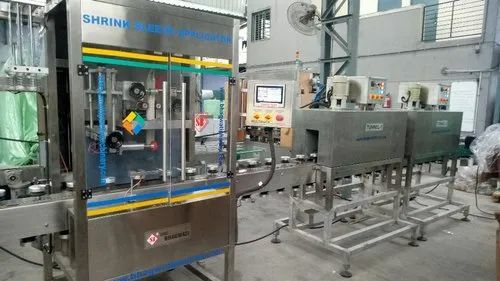 Shrink Sleeve Applicator also called sleever, sleeve binder, shrink labeler and even also called bottle sleeve labeling machine. 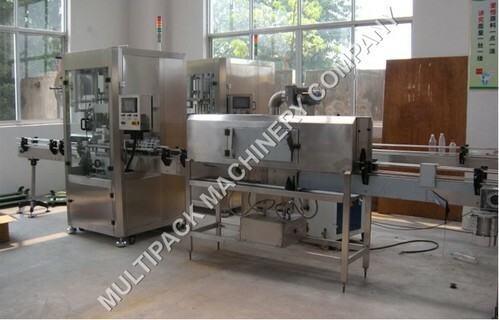 The shrink sleeve applicator machine is used to apply or insert shrink sleeve label on the container. SB manufactures all models for applying heat shrinkable sleeve label or neckbands which is commonly used on most food packages ranging from bottles, yogurt cups, margarine bowls and eye drop containers. Shrink sleeves can wrap and conform to a container's every curve, enabling complete decoration of unusual shapes from top to bottom with 360 degrees. Shrink sleeves are widely used to decorate everything from foods, beverages, cosmetic, medical and even personal products like eye drop, lighter, marker pen. o Servo motors for more accuracy. o Height adjustments to suit various bottle sizes. o Eye mark sensor for accurate cutting in printed sleeves. o Can easily be synchronized with a tunnel. 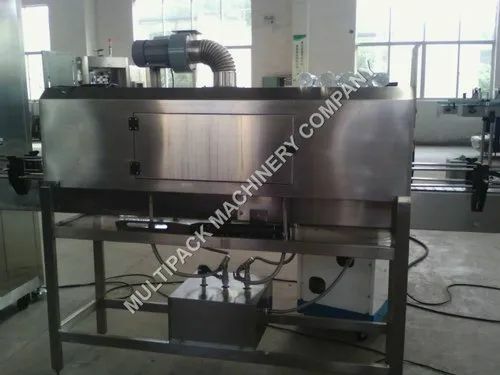 The structure of sleeve applicator and conveyor are made of SS 304 and internal parts will be MS powder coated / hard chrome plated. The SS 304 slat conveyor for proper product conveying(For the processes of sleeve inserting and sleeve shrinking). In-feed screw for the positive feeding of bottle. 3050 mm (L)x 1200mm (W)x 2000mm(H) Approx. Looking for “Shrink Sleeve Applicator , Auto Shrink Sleeve applicators”?